It’s no secret that I believe natural history is important and has a place in the modern scientific curriculum, so I was thrilled to see this initiative from the Ecological Society of America’s Natural History section. The photos and stories on Twitter embody the innate curiousity about the natural world, and the importance of observing the world around us. Kate Clancy recounts three experiences that each took place in an hour and a half. In particular, her musing that keeping the grass watered and green is a metaphor for the struggles and uncertainty of working to improve the learning and research environment while others seek to overhaul/decimate/table-flip it is worth thinking about. I’m obviously late to the much-lauded New York Times op-ed by Hope Jahren but it’s too important to not include here. Personally, I really identified with her sadness (and perhaps frustration) at not being able to travel to countries where she felt unsafe, even though this changed her research path, and obviously influenced the questions she pursued. I’ve mentioned this in passing in the context of LGBT field scientists, too. We still have work to do. What I take exception to is that the list seems to be very/entirely academia-centric. As a scientist working for an NGO, supervising students isn’t part of my job description. And I doubt it is for many in government (though many do). Similarly, I would argue that many field staff that I’ve worked with are indeed scientists even though they have not published papers, secured funding, reviewed papers, or trained students. I’ll be writing more on non-academic science in the future, so stay tuned. Along the same lines, Ambika Kamath led a workshop on how to make women and minorities more welcome in science, and posted her thoughts and recommendations for others wanting to tackle topics of bias in a workshop environment. Props for including orientation and gender! In which Tim Poisot casts the “I’m always busy!” trope as an example of the Red Queen. Teach those time management skills early! Dez Huber tackles a comment by National Geographic Explorer-in-Residence Enrick Sala and makes the case that teaching is the “basic training” or boot camp for the next generation of conservation scientists. Couldn’t agree more. A student in Chris Buddle‘s field biology class had a squished mosquito in their field book, and wrote a poem about it. Natural history can be an inspiration for the arts as much as for science. Chris Parsons has an interesting analysis over at Southern Fried Science of the number of marine conservation papers in various journals, and finds them less likely to be published in general conservation journals. I don’t often highlight specific papers, but there are two that have come across that are worth looking at. AS Glen writes in the Bulletin of the Ecological Society of America on the “golden rule” of reviewing – review for others as you would have others review for you. And over at PLoS Computational Biology, Rougier et al. gives some advice for improving figures. I’ll also plug what I see as a “classic” paper by Don Kroodsma on figure legends. Again from Tim Poisot, an analysis of the gender disparity in various ecological journals. Spoiler: it’s not great. Rebecca Schuman nails it once again in this must-read on the prevalence of alcoholism among faculty, and the consequences for those who don’t partake (or even with less frequency). How to tell what your UK or US prof/colleague means in handy tabular format. Finally, but certainly not least, I’d like to highlight a new initiative to profile LGBT scientists that Beth Hellen started recently called LGBT STEM. I highly recommend you check it out, and if you’re an out worker/student in STEM, submit your own story. Jeremy Yoder highlighted (again) the perceived lack of queer STEM mentors for young scientists, as was described in Jack Andraka’s op-ed in The Advocate. The title of this post is a little tongue-in-cheek because preprints are a relatively recent adoption in ecology, conservation, and environmental science, and natural history is, of course, the foundation of ecology, conservation, and environmental science. Regardless, though, I think preprints have a huge role to play in natural history. Preprints are non-peer-reviewed documents that are posted in online repositories where others can comment on them, authors can upload revised versions, and most importantly, get information out. Preprints are often submitted to journals, and their ultimate version usually contains the same text as the journal article. Importantly, the preprint is archived, is citable (with a DOI), and gets the information into the world and out of our filing drawers (or more likely, computer folders and field books). The case for preprints in biology is fairly strong, and I’ll add one more: natural history and conservation. Natural history, I’ve argued (as have many, many, many, many, many others) is an important part of modern science. Sadly, not everyone agrees (but this is my blog, and they’re wrong). But there are still journals that value (and are dedicated to!) natural history, and rightly so. But even putting together a “natural history paper” isn’t trivial. There are still hypotheses, observations, analyses, and interpretation. Now, maybe it’s a particular proclivity of ornithologists, but we tend to write a heck of a lot of reports – to government agencies, for permits, and to funders. These often have some preliminary analyses, lots of methodological detail and background, and in the case of most of my field studies, heaps of “ancillary information”. 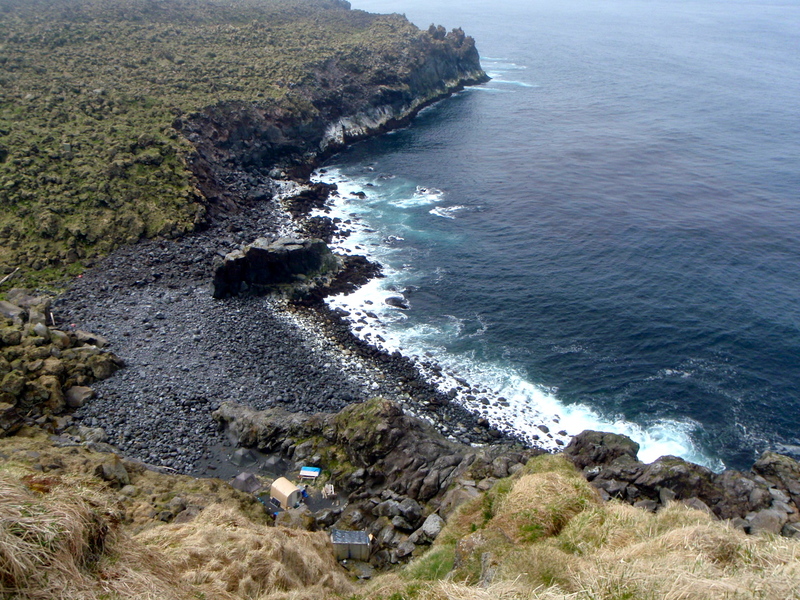 During my PhD, my primary field site was Kiska Island, a lovely volcanic island in the Rat Islands group of the Aleutian Islands, Alaska. It’s a fantastic spot, and cumulatively over the four years, I spent nearly 300 days there (probably the 2nd largest amount of time of anyone alive right now). Each year, we filed a summary report with the US Fish and Wildlife Service that detailed the effects of introduced rats on Least and Crested Auklets. But we also did much more than that. In particular, we (and the other 3-6 ornithological research camps in the Aleutians each summer) compiled an annotate list of bird sightings. “Hey!” I hear you exclaiming, “That’s some pretty awesome natural history data form a neat part of the world! When will you write it up?”. Sadly, the answer is not anytime soon. This makes me sad, but my current job doesn’t allow for Natural History Fridays. What if you were interested in the distribution and effect of introduced predators on Aleutian Cackling Geese? Or were examining range-wide variation in Glaucous-winged Gull egg size? You would have no way of knowing that I collected useful data because it’s in an unpublished government report (or other “grey literature”), and doesn’t merit a paper or note on its own. If I had deposited my annual reports in a preprint repository like PeerJ PrePrints, or bioRxiv, not only would these data be out there, but others could cite my report/preprint. Furthermore, the publicly available copy wouldn’t just be the one on my old lab’s webpage, but it would be available after I’m long gone, and since it would have a DOI, it would be easy to find. Tracking down grey literature is a royal pain. Reports are rare, are often poor black-and-white reproductions, and usually hard to find in the first place. Citations of grey literature also tend to be more prone to errors, which exacerbates the whole process of finding them. And, I think most importantly, the information they contain doesn’t always make it into a paper. All solved if they were deposited on a preprint server. We are, after all, already producing these reports, and more importantly, they’re already cited frequently, and data appearing in these reports is also in published papers. So the reality is that nothing would really change, except that the information would be more widely available, better curated, and citable. I don’t see a downside. So if you are, in fact, interested in the distribution and effect of introduced predators on Aleutian Cackling Geese, or variation in Glaucous-winged Gull egg size, you will hopefully soon be able to add my wee bits of data to your analysis. When my various colleagued return from the field, I’ll convince them that we need to deposit our annual reports in a preprint archive. In the meantime, you can see them on the “Downloadable reports” section of the Kiska webpage. Picture this: it’s the Age of Enlightenment, and you’re a budding young “natural philosopher” (what we now call a scientist) sitting in your study. All through the summer, you’ve observed swallows, cranes, thrushes, and more in the local area, but very slowly they start disappearing until, in roughly early November, they’re gone. So what happened to them? 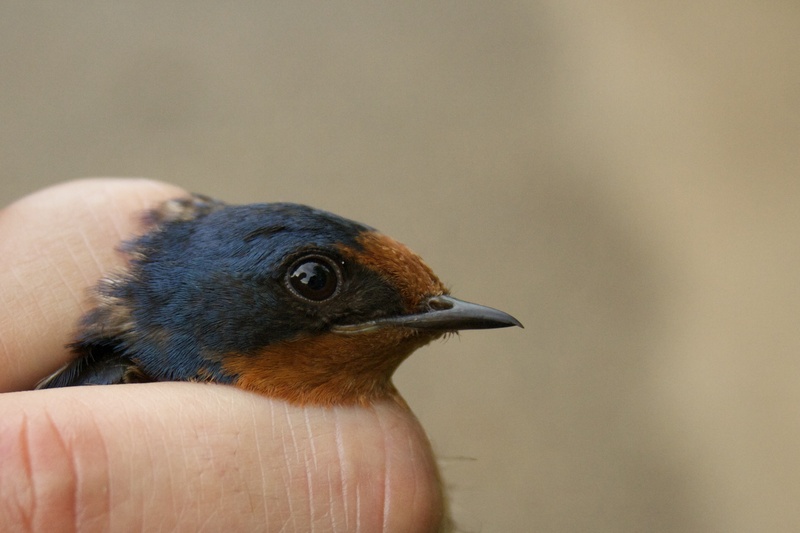 Where do birds, like this Barn Swallow, go in the winter? Aristotle and his students believed that swallows hibernated, for example. Or that the birds that arrived for the winter were the transmuted birds they had seen all summer long. A 1703 pamphlet* called “An Essay toward the Probable Solution of this Question: Whence come the Stork and the Turtledove, the Crane, and the Swallow, when they Know and Observe the Appointed Time of their Coming” postulated that when birds disappeared in the fall, they went very far away. About 384,400 km away in fact. To the moon. It seems rather obvious to us now that birds (and many other animals) migrate – they breed in one area, and “winter” in another to make use of the seasonal abundance of productivity at higher latitudes in the summer months. The Arctic Tern has the longest migration of any animal yet recorded: averaging 71,000 km/year from Greenland to Antarctic and back. If the average Arctic Tern lives 20-25 years, that’s about 1,500,000-1,750,000 km in their lifetime. Truly incredible. 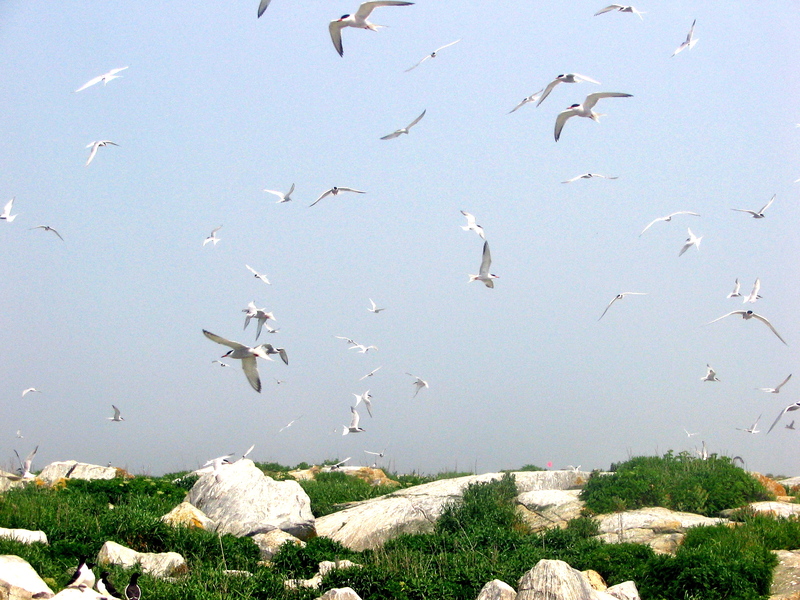 These Arctic Terns breeding in New Brunswick fly to the edge of the Antarctic ice sheet for the “winter”, so they actually experience perpetual summer. And huge congregations of migratory birds, like Snow Geese, can completely cover the landscape for kilometres at a time as they move in the millions. But our 18th-century natural philosophers didn’t know this yet. On May 21st, 1822 on the Bothmer Estate in Klütz, Mecklenburg, Germany, someone shot a White Stork. You see, this was the 2nd time someone tried to kill this particular stork, but the first time didn’t go so well (for the hunter), and the stork got away. With a spear in its neck. It was an “arrow stork” or “Pfeilstorch” in German. And it was the key to one of the most amazing, elusive, and important parts of animal life history: migration. A “Pfeilstorch”, or “arrow stork” at the University of Rostok’s zoological collection. When the Pfeilstorch was taken to the University of Rostock (where it still “lives”), the spear was immediately recognized as something not from Europe. In fact, it was from Africa. 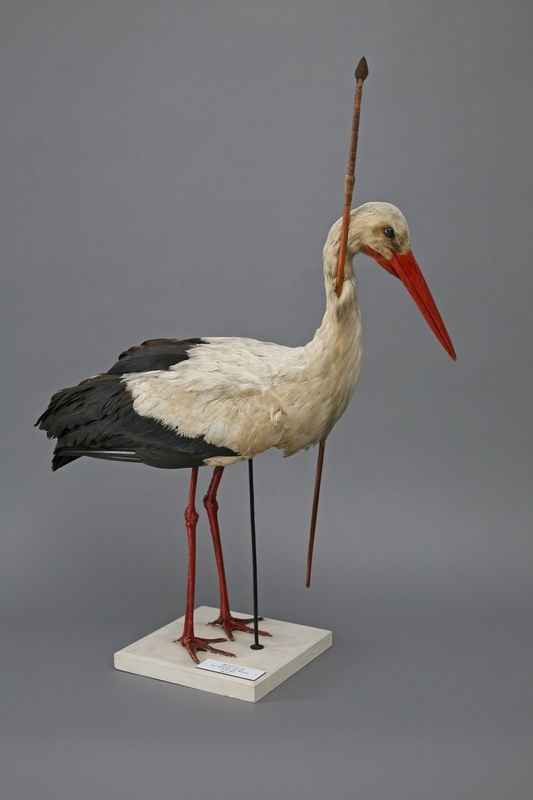 A stork flew from Africa with a spear through its neck, only to be shot in Germany. 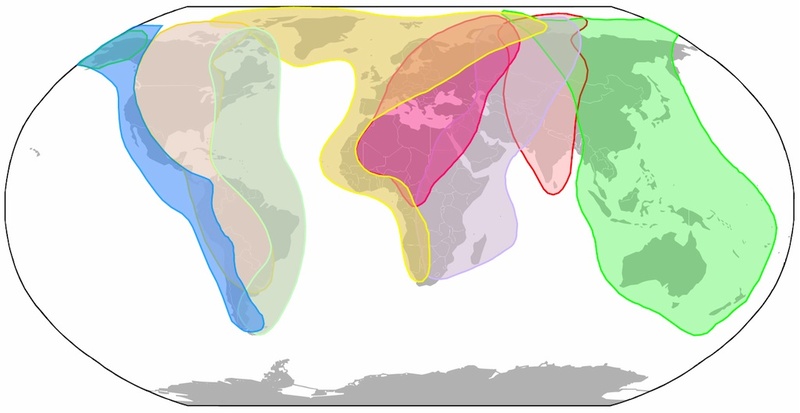 We now know that White Storks winter in sub-Saharan Africa, particularly savannahs from Kenya to Uganda, and as far south as Western Cape, South Africa, and not on the moon. In fact, most bird migration falls along several well-known “migratory flyways”. Before this, though, we had no idea where storks went in winter. Other popular theories included hibernation (in locations unknown, including underwater), and the aforementioned lunar journey. There are 25 known Pfeilstorchs in natural history collections, mostly in Germany and west-central Europe. But given that spears are used less commonly these days for hunting of birds (and it’s pretty darn hard to spear a swallow), how do we study bird migration now? In 1899, Dutch teacher Hans Mortensen began putting aluminum rings on the legs of birds that he captured. He inscribed the bands with his address, and instructions to contact him should the band be found. In North America, bird banding (as it became to be known) started in 1902 when Paul Bartsch banded Black-crowned Night-herons in the eastern US. Now, banding is coordinated through the US Bird Banding Lab and Canadian Bird Banding Office, banders apply for permits, and keep an inventory of myriad band sizes for any species in North America. There’s also the North American Banding Council, which oversees best practices and training for banders (and I happen to be on the board). Bands, for example, helped us discover where Chimney Swifts spent the winter (PDF of the 1944 USFWS press release), 69 years ago this month. 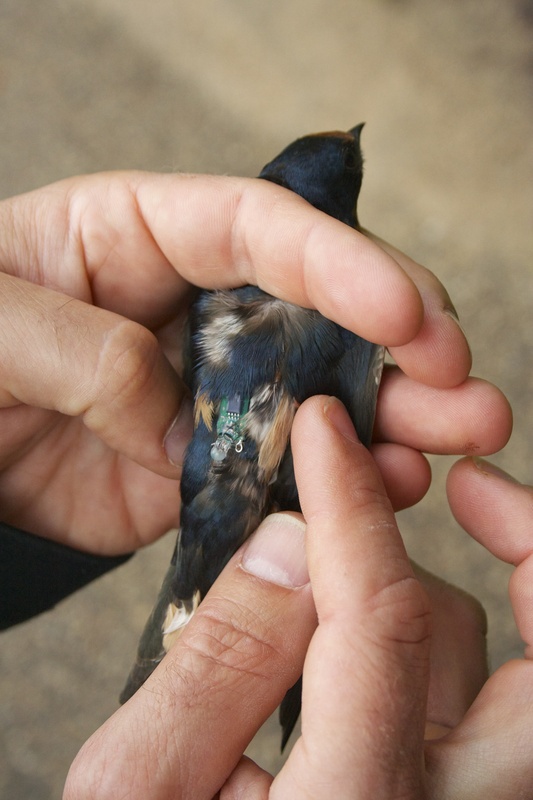 In addition to bands, telemetry gear that senses light levels can be used to track migration in birds as small as Barn Swallows, which we now know spend their winters from southern Mexico to central Brazil and northern Argentina. This small geolocator deployed in Saskatchewan will calculate this Barn Swallow’s position each day, and when we recapture it in 2014 and download the data, we can see where it spent the winter (likely Mexico or Colombia). But there’s one thing that Aristotle, natural philosophers of the Enlightenment, 19th-century German marksmen, and us today can agree on – bird migration is one of the most amazing parts of our natural world. I’ve argued for some time that natural history gets short shrift in the next-generation sequencing, -omics proliferating world of today’s biologist. By natural history, I mean observations of species, events, habitats, or behaviours. I think it’s safe to say that without the solid foundation of natural history, much of today’s ecology, and biology in general, wouldn’t be possible. The major ornithological journals (Auk, Condor, Ibis, Wilson, and the then-German Journal of Ornithology) all got their start in the late 1800s. You can go back and look at some of the articles that passed muster, and you’ll see lovely titles like “A Barn Swallow’s Nest on a Moving Train” published in the Condor in 1935. Such “purely observational” notes would never pass as “research” in today’s hyper-competitive publishing gauntlet. Or would they? There are still some journals out there that embrace this aspect of science. The Canadian Field-Naturalist, once bemoaned for its 2+ year lag in publishing has caught up, has a snazzy new website where past issues are available (others can be found on the Biodiversity Heritage Library), and keeps a fairly active presence on Twitter. Other outfits like Northeastern Naturalist (or Southeastern, Northwest, Southwest, and American Midland Naturalist) complement each other in geographic scope. I got into biology for the field work. I love being outdoors, living in remote places, interacting with amazing creatures (and their habitats). And like those a century before, when I find myself somewhere for a lengthy period of time with no power, phone, radio, computer, or running water, I notice things. Sometimes these are little things, like an oddly-coloured individual. Other times, they’re larger things, like a significant species occurrence record, or a volcanic seep. Field camps are the birthplace of natural history. This was my camp on Kiska Island, Alaska, during my PhD. 2 tents, 1 weatherport, 11 weeks. The initial goal of publication in the Philosophical Transactions of the Royal Society (the first academic journal, founded in 1665) was to tell other Fellows of the Royal Society of all things various and sundry. Who could forget, after all, the 1674 classic by Dr. Johnstones: “An observation of Dr. Johnstones of Pomphret, communicated to him by Mr. Lister, and by him sent in a letter to the publisher, concerning some stones of perfect gold-colour; found in animals”? But I digress. I’m pretty lucky in that I have the flexibility to dedicate a few hours of my week to projects that some might see as frivolous or unnecessary. But I don’t think these projects are frivolous or unnecessary – I find them enjoyable, and some may result in a publication or two, and all increase our knowledge of species, habitats, or phenomena, which, after all, is what science is all about.